1. Preheat the oven to 160°C/320°F/Gas Mark 3. 2. Brown the mince with a little oil in a large saucepan, add the cooking sauce and cook uncovered for 3. 15 mins, stirring as you cook. 4. Meanwhile, peel the onions, cut into halves and slice into medium slices. 5. Chop the peppers into halves, discard the seeds and white pith and slice the same as the onions. 6. Add the peppers and onions to the mince and cook stirring for another 10 mins, watch that the mixture doesn’t burn - you want it to be quite dry. 7. When cooked keep warm in the oven. 8. Put the tortilla wraps in the oven to warm through as per pack instructions. 9. To make the guacamole - score the avocados in half, then twist to remove the stone, then with a fork mash them in a bowl with some lime juice, and onion, garlic & herb dip. 10. 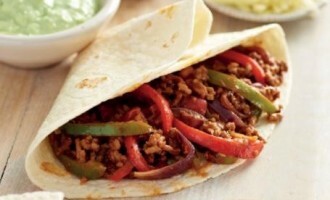 Serve the mince in a bowl alongside bowls of salsa, grated cheese, guacamole, and sour cream for self-serving fajitas with warmed wraps.